Created on March 13, 2013, 8:04 p.m. by Hevok & updated by Hevok on May 2, 2013, 5:16 p.m. The Linked Data or Linked Open Data Cloud is a huge network of Datasets that are published via the Linked Data Principles and Linked to each other. In Wikipedia the right info box is nothing else than structured data (name-value pairs) which simple can be read in an automated way and can be translated in an automated way into RDF. Out of this comes the DBpedia. Behind this tables and the Classes there must be Ontology. Each Individual that represents and Article in DBpedia/Wikipedia is also connected to a Class in an Ontology to represent Knowledge about this Class. Also all the Properties must be be Properties of the Class that must be represented then it makes sense and one can define a RDF or OWL Class for that Class that is represented by the Individual in the Wikipedia Article and one comes up with DBpedia data. The blue color stands for Media or Multi-Media Data. The orange part is the user-generated Content, like Yovisto for academic Videos. The green part is made out of Publications, so it is Bibliographically Data mostly. In blue-green there is government data which is a rather huge part of the available linked open data cloud. The yellow part are the Geographic Data. In White are the cross-domain Data like the encyclopedias like the DBpedia and Ontology like YAGO and UMBEL. The red part is Life Sciences. Life Sciences data is almost Legacy Data, because in Life Sciences one tried to build up Ontologies, Knowledge Representations for much long time than one does in the Semantic Web. So they have been translated from their original Representation into RDF which is a rather huge part of the Linked Data Cloud. The most Triples are in the Government Datasets (40%), while Life Sciences is rather small with 10%. The Situation is completely different for the Interlinking of the data. The Government Data makes up only 4% of all the Links, therefore if it comes to the Links it is badly connected. The Life Sciences are much better connected with 10% of the Triples but almost 40% of the Links. So it is here vice versa. Therefore it is rather valuable and important if one includes new data also to establish Links to already existing Data, because only then one can make use of it. The different Categories of Datasets are marked with a different color so that one can distinguish among those Dataset. Datasets of the Linked Data Cloud are connected (amongst others) via owl:equivalentClass between equivalent classes and via owl:sameAs between identical Instances. The Ontology is that which holds the interlinked data Cloud together in general. 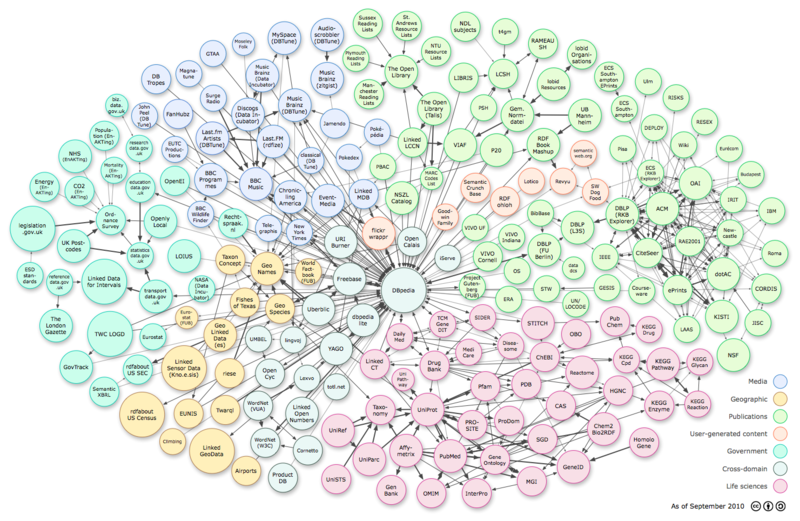 The Application of the Linked Data Principles leads to a "Web of Data"